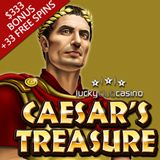 Up to $333 casino bonus that includes free spins available until March 31, 2016. Lucky Club Casino offers dozens of unique games from Nuworks Gaming including Martian Mania, Bank Bandit and the new vampire-themed Fangtastic. Its Monster Millions slot currently has a progressive jackpot of over a million dollars. Lucky Club, which recently increased its new player welcome package to a series of casino bonuses totalling $2222, offers dozens of online casino games from Nuworks Gaming with several secure banking options, it is able to welcome players from all over the world.